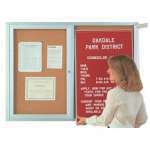 Presentation boards are essential tools for providing information in schools or offices. From traditional bulletin boards and chalkboards to advanced interactive whiteboards, Hertz Furniture offers what you need. 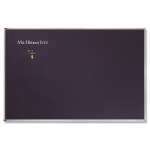 With the right blackboard or dry erase board, you can conduct outstanding business presentations and classroom lessons. Are blackboards or whiteboards better? That depends on what you prefer. 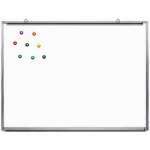 Specialized whiteboards, such as music boards and magnetic boards are great if thats what you need. All of our boards are made according to the same high standards, to give long-lasting use. Where is a good place to put a bulletin board? 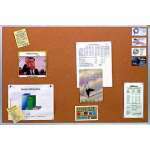 Bulletin boards are great to have in cafeterias, staff lounges, hallways and classrooms. They provide the perfect space for hanging up fliers for upcoming events and displaying important announcements. With a few tacks or staples, attractive pictures and exceptional student compositions can be hung up for display in no time. When an event has passed or it is time for some fresh scenery, the display space can be rearranged in a flash. When papers are constantly being hung up and taken down, you want to make sure that the surface won't be ridden with holes or permanently damaged. With self-healing cork boards from Aarco, there is no need to worry about pins leaving holes behind when they are taken out. 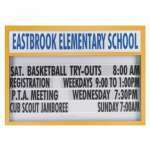 If your display board is going to be in direct light, it is worth considering a model that has a vinyl surface. Unlike cork, vinyl will not fade. While a regular tack board might be ok for an office or high school, it is important to be careful about pins and staples in any environment where there are many small children. With self-adhesive bulletin boards from United Visual, you can enjoy the benefits of excellent hanging space without using any small sharp objects. With this option, there is no need to worry about tacks and staples accidentally falling on the floor and causing a potential hazard. How do I choose between a blackboard and a whiteboard? Every teacher needs a writing space at the front of the room, whether they are teaching math, science or Spanish. Blackboards provide a highly-visible surface on which educators can provide illustrative examples or write down key terms. With clear examples and visual displays, it is easier for students to focus in class and understand complicated methods and techniques. 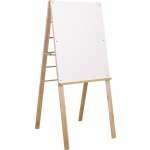 Although chalk boards are the classic choice, many educational institutions prefer to use whiteboards. It is easier to see the writing on dry erase boards because their white background enables them to be used with a variety of contrasting colors. Because markers are used instead of chalk, the problem of dust is eliminated. White boards can also be used as a projection screen, which is always helpful to have in the modern classroom. 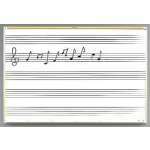 A clear writing surface is necessary in many professional applications as well. An executive office, training room or boardroom in which meetings often take place requires a surface on which new ideas, business plans and schedules can be displayed. 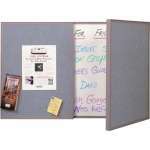 Veneer presentation boards have attractive doors which coordinate with other office furniture when not in use, but open up to provide a whiteboard or corkboard. This combines a professional appeal with functional space. Should I get a mobile or wall-mounted board? Blackboards and whiteboards come in two main styles. In classrooms, the wall-mounted style is generally preferred because a clear surface is needed on an almost constant basis. For multipurpose rooms which are sometimes used as classrooms or training rooms, mobile boards can really come in handy. While wall-mounted boards offer the security of knowing they will always be there when they are needed, mobile boards can turn any room into a functional learning space. Many of our mobile models are double-sided as well, so they provide twice as much space for notes and diagrams. Having the right space to write on or hang signs makes a teacher's day run more smoothly. Whether you need chalkboards and dry erase boards for a professional or educational setting, Hertz Furniture has a great selection of models. If you need help determining the ideal surface material, size or style, contact the Hertz Design Center for free project-planning advice.